In March 2001 I published Vermeer's Camera, a book exploring the proposition that the Dutch master used the camera obscura as an aid to painting.1 The book has provoked a gratifyingly large correspondence, from painters, photographers, architects and experts in computer graphics as well as art historians. The critical reception has been generally kind; but there have been a few dubious notices by Vermeer scholars and curators of 17th century Dutch painting. In this article I report some of the most interesting suggestions made by correspondents, and offer counter-arguments to the book's critics. It may be helpful to begin with a short resume of the main findings reported in Vermeer's Camera. The book shows how it is possible to reconstruct the three-dimensional spaces seen in ten of Vermeer' s paintings of domestic interiors, using a method of 'inverse perspective' (roughly speaking, a reversal of the normal procedures of perspective drawing).2 It is further possible to find a common scale for all these spaces, such that three conditions are satisfied. First, the dimensions of the various architectural features - the floor tiles, the windows and their spacing in the wall, the ceiling joists, and the overall floor-to-ceiling height - are closely similar throughout. Second, the shapes and sizes of those recognisable pieces of furniture that appear repeatedly remain the same from one picture to the next. Third, items shown by Vermeer of which the originals, or copies, survive in museum collections today have their actual dimensions as measured from the real objects. These objects include two designs of chair, the virginals in 'The Music Lesson', several paintings by other artists that Vermeer shows hanging on the walls of the rooms, the Delftware tiles used as skirtings, and a series of printed wall maps and globes. I will say more about these shortly. It is very hard to resist the conclusion that all ten paintings depict one and the same real room, with furniture and models rearranged for the different compositions. 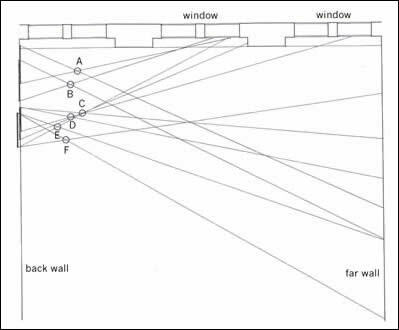 One very distinctive feature of the architecture, visible in eight pictures - and whose repetition supports this thesis - is an elaborate design of leaded panes in the casement windows, forming a pattern of interlocking circles, semi-circles and squares. Eight paintings (not the same eight) also share the characteristic black and white marble floor tiles. (The precise arrangement of these tiles varies however, and two pictures show a quite different design of smaller ceramic tiles. I will come back to this point.) The position of the back wall of the room, behind Vermeer's vantage point and behind us, the viewers, is just visible in the mirror seen hanging on the far wall in 'The Music Lesson'. Figure 1: Plan of Vermeer's room with viewpoints (small circles) marked for six paintings: (a) 'The Girl with a Wineglass', (b) 'The Glass of Wine', (c) 'Lady Writing a Letter, with Her Maid', (d) 'Lady Standing at the Virginals', (e) 'The Music Lesson', (f) 'The Concert'. The diagonal lines mark the extent of what is visible in each picture. The heavy lines at the back wall mark the widths of the six projected images: each is the width of the respective painting. This result can hardly be due to chance.5 It must be a product of Vermeer's working methods. Paul Taylor of the Warburg Institute made some calculations of the probability of the phenomenon occurring at random.6 He also consulted Tim Gowers, Rouse-Ball Professor of Mathematics at Cambridge. It is perhaps not very meaningful to cite a precise value for the probability, since any numerical result depends, among other considerations, on the assumptions made about accuracies of measurement. But on reasonable assumptions, Taylor and Gowers calculate that the odds are hundreds or even thousands-to-one against. The explanation I offer in the book for this very curious geometrical property of Vermeer's perspectives, considered collectively, is that it is a consequence of him using a camera obscura in the form of a booth or cubicle. He would have worked in semi-darkness inside this cubicle. The camera lens would have been positioned at the theoretical viewpoint of the picture for each composition, and the back wall of the room would have served as the projection screen. The projected images of the room are the same sizes as Vermeer's canvases, because he has traced them. I have tested this hypothesis both with a 1: 6 scale model and a photographic plate camera taking the place of the camera obscura; and in a full-size reconstruction of the room complete with booth-type camera. I have not been able, despite much thought, to come up with any plausible alternative explanation, by reference to other methods that Vermeer might conceivably have used to set up his compositions - standard mathematical perspective procedures, the tracing of reflections in plane mirrors, or the use of some kind of grid-frame after the manner of Alberti's 'veil' or Dürer's various perspective machines - nor have the book's sceptical critics.7 The phenomenon is very simply and directly accounted for, meanwhile, by reference to the geometrical optics of the camera obscura. In the I book review the many other forms of evidence that have been adduced by writers in the past for Vermeer having used the instrument. These include the painter's sometimes 'photographic' perspective effects, his reproduction in paint of certain artefacts of slightly unfocussed lenses, and above all his uncanny accuracy - remarked on by Lawrence Gowing and several other critics - in the rendering of tone. My own original contribution is in the analysis of the perspective geometry of the pictures.